Renaissance music for Voices and Viols, Morales to Esteves via Guerrero, Victoria, Cardoso and more! Glorious multivoice choral works with instruments. Musical Director JanJoost van Elburg, Newe Vialles and Martin Perkins: organ. 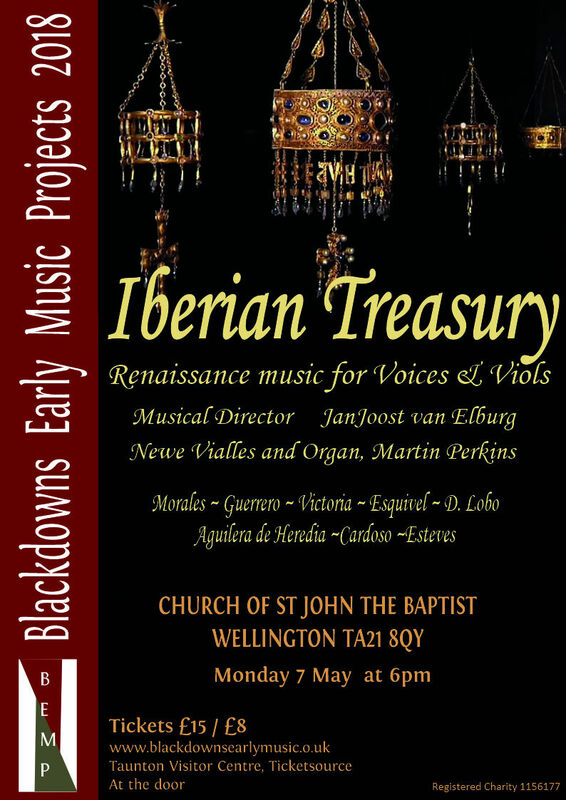 Long awaited Bank Holiday sunshine provided a suitable backdrop for a sonically spectacular concert of Renaissance Spanish and Portuguese music for voices and viols, presented by Blackdowns Early Music Projects in St John’s Church, Wellington on 7 May. Comment overheard – “It all sounds the same”. With respect – no, it doesn’t. Cultural relations between Iberia and the rest of Europe, reflecting political developments, experienced periods both of intense interchange and also relative isolation. Composers studied in Rome – and returned to the gloomy recesses of the monasteries of their native land. Hence their music contains echoes of the calm serenity of Palestrina or the technical virtuosity of Lassus, but above all has a uniquely austere, mystical intensity – and sometimes raw vigour – which must derive from the arid, sun-baked landscape, the fervour of Iberian Catholicism, and the personality of the people of the peninsula. This was convincingly demonstrated in works for one, two and three choirs covering nearly two centuries, by Victoria. Morales, Guerrero, Lobo and lesser-known masters. The singers, under the crisp and skilful direction of JanJoost van Elburg, were on top form with ample, well-balanced tone, impeccable tuning (almost always!) and some fine solo performances. Intricate, contrasting strands of counterpoint were well sustained and shaped, but occasionally, for example in the Salve Regina of Victoria with its passionate and moving text, climactic moments of rhythmic contrast or expressive dissonance could have been more intensely delivered. A fascinating and relatively unknown novelty was the Mass for 8 voices by Esteves – an 18th-century work which looks back to Renaissance style, although more to the Venice of Giovanni Gabrieli than to the Rome of Palestrina. The singers visibly enjoyed the dialogue between the two choirs as well as the dancing rhythms. In many of these works the singers were partnered by a consort of eight viols – participants in the first South West Viol Fest – as well as by Linda Sayce (theorbo) and Martin Perkins (organ), which added a delightfully plangent, expressive and vigorous dimension to the music. One can risk the assertion that never before have eight viols played together in Wellington Church! The tutors – Caroline Ritchie and Henrik Persson – supported by the continuo instruments, entranced the audience with two virtuosic pieces by Diego Ortiz. On the previous evening, Caroline, Henrik and Linda had given a memorable concert of French Baroque music in Culmstock Church. Music lovers thus owe grateful thanks to Blackdowns Early Music Projects for not one, but two outstanding concerts to broaden the mind and enrich the spirit.